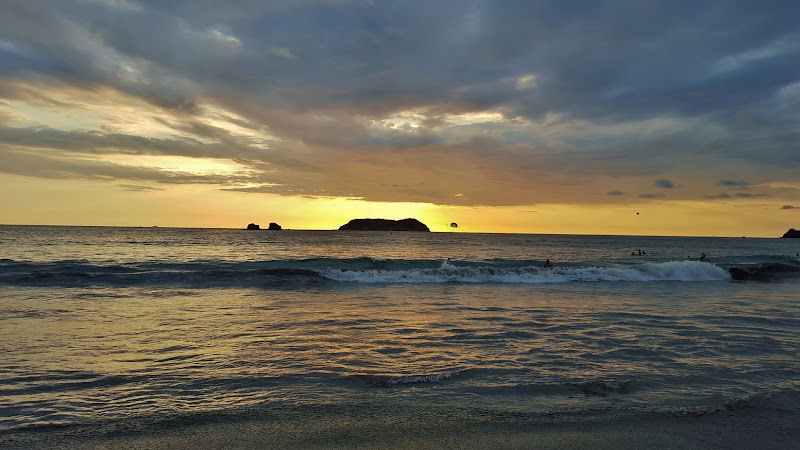 Holiday Trip to Costa Rica - Take a Hike! 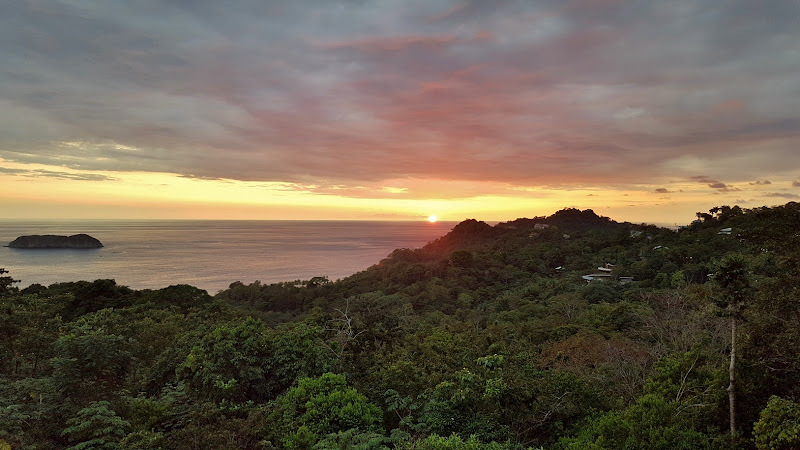 For the holiday season this year, Sandy and I headed to Costa Rica for an action-packed week of adventure and fun. My employer has an end-of-year holiday shut down and I didn’t want to let perfectly good vacation time go to waste. We left Raleigh early on Christmas Eve. Since the holidays are peak travel time, everything was very busy. We had to have our car valet-parked at Fast Park and Relax before heading to the airport as the parking lot was completely full. Fortunately, we made it to the airport in time and none of our flights were delayed. We flew to Charlotte and from there to San José. It was quite warm in Raleigh when we left, so not much of a difference in temperature when we arrived in Costa Rica. After deplaning and clearing customs, we found our driver and met Dana from Toronto, another tourist on our G Adventures trip. The driver took us to Hotel Autentico in San José and after checking into our room, we headed out to get cash from a bank and had a late lunch/early dinner at Soda Tapia. Sandy and I both got a steak sandwich. They were good, but really big. We should have just split one. 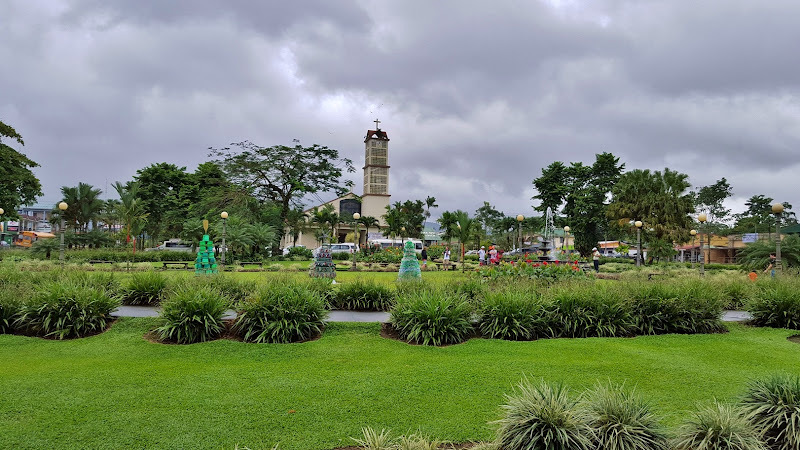 After eating, we went for a stroll around Parque la Sabana, the central park of San José. 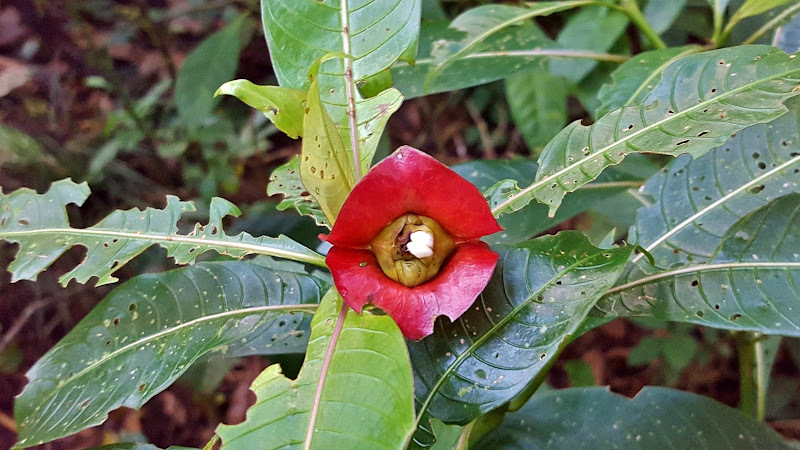 The tropical flowers blooming in the park were absolutely beautiful, including some bright yellow trumpetbush. We also saw male great-tailed grackles, a bird that looks somewhat like a crow with a long tail. There was a huge Christmas tree sponsored by Coca-Cola, as well as a pretty artificial lake with ducks. As the sun was beginning to set, we had beautiful views of the lake. We then headed back to the hotel and met up with more of our tour group and our amazing tour guide, Ro. After introducing ourselves, Ro went over some of the logistics of the trip and background information. After the meeting, we went for dinner in the hotel. Sandy and I weren’t hungry as we had eaten so much just a little bit earlier so we had a couple drinks and socialized with the group and then went to bed early. 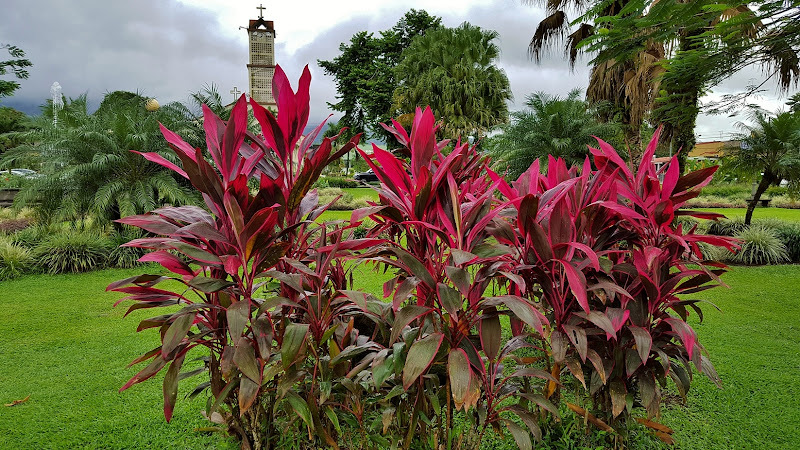 Christmas day was our first full day in Costa Rica and we would be heading to La Fortuna from San José. Since it’s on the way, Ro suggested we do whitewater rafting today and do activities in La Fortuna the following day. Everyone agreed, so the full group was doing rafting. We boarded our van around 730 and left San José. Past Alajuela, we stopped at a small roadside shop to pick up some breakfast. 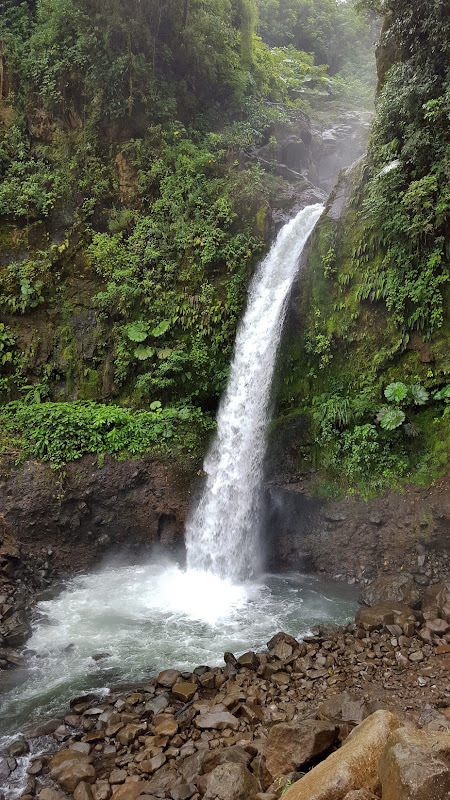 Further north, we made our first sightseeing stop at La Paz Waterfall, a beautiful 120-foot roadside waterfall along Route 126 just past the La Paz Waterfall Gardens. We got off the van and had the chance to walk around for a bit to see the waterfall from different angles. After this stop, we made a quick stop in San Miguel, so everyone on the tour who needed water shoes could pick some up and then we got off the main road to head to the put-in for rafting on Rio Sarapiquí. A few other vans of tourists were rafting as well, so there were about eight boats heading down the river. Sandy, Tim, and I were in one boat with our guide Jeffrey. After reviewing safety and rafting instructions, we took to the water. This section of the river is great for whitewater rafting with class II, III, and IV rapids. We’ve done whitewater rafting in the past and generally there are some good rapids, followed by stretches of relatively flat water. Not so on Sarapiqui. It was pretty much rapid after rapid and rapid. It was a lot of fun and we got very wet. At one point, a waterfall tumbled down a small tributary into the river. 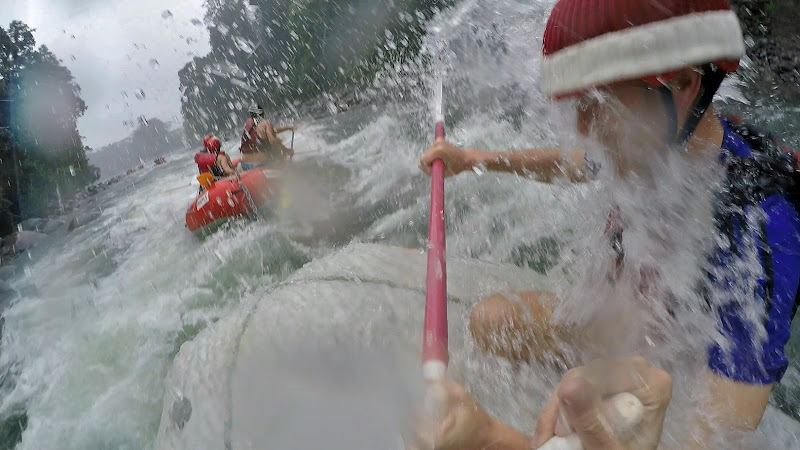 Our guide steered our raft so that we went directly under the waterfall and got drenched. After drying out a little, the vans took us all back to the outfitters’ place and we had a big lunch here. After lunch, we continued on towards La Fortuna. About half-way there, near Aguas Zarcas, we stopped for a restroom break at a grocery store. Ro pointed out a three-toed sloth high in a tree in the parking lot. He was a little too high for a good shot of him, but we could definitely see his three claws. Having a local around to point out stuff like that was great. After this break, we continued on the rest of the way to La Fortuna. First, we stopped at the Desafio office to pay for our whitewater rafting and to book activities for the following day. Sandy and I had purchased the adrenaline bundle, so we would be canyoneering/waterfall rappelling and one more activity. 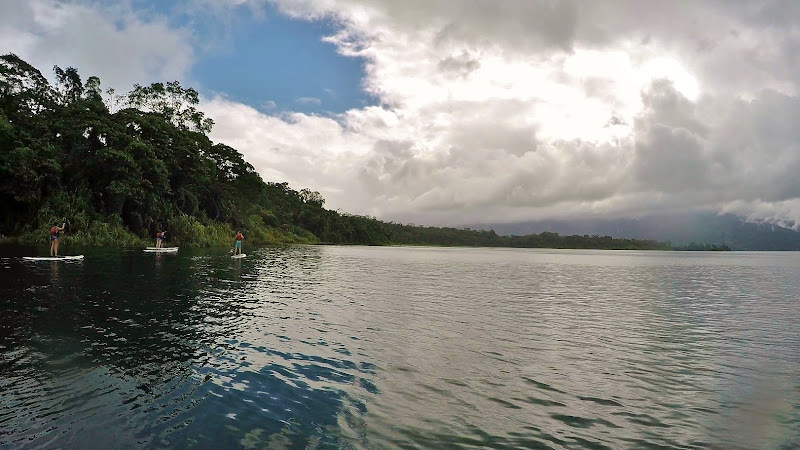 We decided on stand-up paddleboarding on Lake Arenal. Once done here, we headed to our hotel, Monte Real. The hotel had a nice pool and scenic grounds and the room was very nice. The room was much larger than the night before with a queen size bed, instead of two twin beds. There were lovely flowers blooming all around the grounds of the hotel. After getting settled into our room, we met back up with the group and headed into town for a group dinner at Lava Lounge. I got a cheeseburger here and it was good. After dinner, Ro arranged for a van to pick us up and drove us to a hot springs. Well, not exactly a spring, more like a hot river. We parked near the Tabacón Thermal Resort entrance. This free attraction wasn’t well known with tourists and was more popular with locals. A few amorous couples could be seen in the warm water. We walked down to the river and then river-walked upstream to a nice spot to sit in the warm water. I think that this river originates at the resort and the warm water continues flowing out on its way to Arenal River. The current was moving quite quickly, so we had to really anchor ourselves to the ground. It was raining, but the cool rain got canceled out by the warm river water. After about an hour enjoying the warm water, we headed back to the van and back to our hotel for the night. Saturday morning we woke up and met Ro at the hotel lobby. For breakfast, we headed to Rain Forest Café. The American breakfast, consisting of eggs, bacon, and toast was really good. They also had great coffee. I’m not a big coffee drinker but the café con leche from here was great. Sandy made friends with a local stray dog who wandered into the restaurant. She named him Bert. 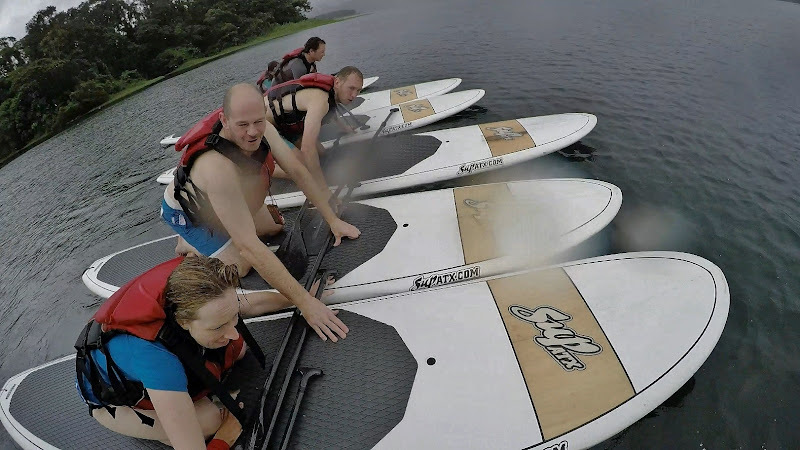 After breakfast, we headed back to the hotel and were picked up to go stand-up paddleboarding on Lake Arenal. The van took us just past the dam where we got onto a boat to head out onto the lake. After our instructor gave us some quick instructions on how to paddleboard, we tossed our boards in the water and jumped in. It was raining about the entire time, but we were going to get soaked anyway, so it didn’t really matter. We paddled around the lake for a while and then our guide had some games and fun for us. First, he had us try to do hand-stands and yoga poses on the board. I was not very successful at all and fell off immediately on every attempt. Aside from the guide, no one was particularly good at this exercise. But it was raining so much, it didn’t really matter when we fell in. In fact, we joked that we could “dry off” and get out of the rain by staying in the water. We paddled a little further on the lake and then we tried another game. Everyone lined their boards up next to one another and one at a time, we’d try to run across the boards and jump in at the end. It’s harder than it sounds. A few people were successful in running across all the boards. I made it to the second-to-last before falling in. Once back, we were dropped back off at our hotel. We had an hour or so until it was time for canyoneering, so Sandy and I walked into town and stopped at a store to get some snacks and drinks. 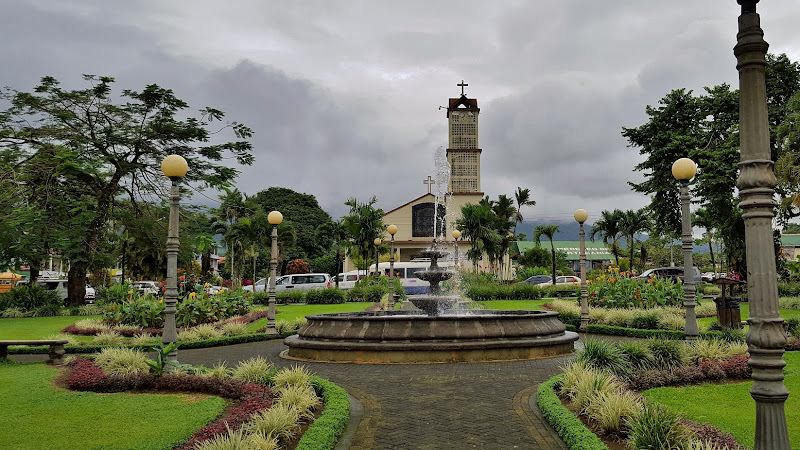 Then we headed to the park in the center of La Fortuna to eat a snack and enjoy the view. 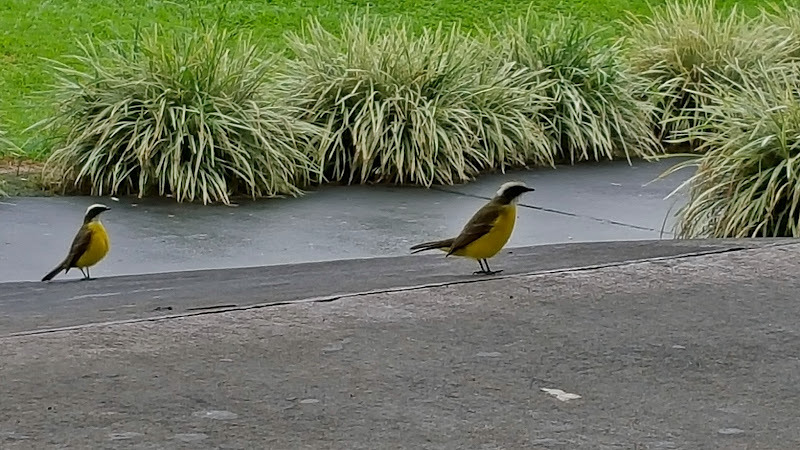 A couple little yellow flycatchers, maybe Great Kiskadees, were flying around the park. After our snack, we walked around the park to see the gorgeous tropical flowers. The park itself was quite nice too, with a fountain in the center and a view of the church just past the park. Unfortunately, it was also too cloudy to see Arenal Volcano. After a short stroll, we headed back to the hotel to head to Lost Canyon. Everyone in the group was doing canyoneering, including Moira, Davis, and Emily. Their flights had been delayed, but finally were able to meet up with us at this point. We arrived at Lost Canyon and were transferred to 4WD vehicles, the "Jungle Limo" to drive up a rough gravel road to the facilities. They had lockers where we left all our stuff and then we hopped in another Jungle Limo and drove further up the mountain. We stopped up here and after a quick instruction on rappelling technique, headed into the canyon. To make things easier, we were broken up into groups of five or six. Guides were present at the start and end of each rappel to ensure we completed the canyoneering safely. After a short hike through the canyon, we came to the first waterfall, about 10 feet. This was a pretty easy rappel as the waterfall wasn’t completely vertical, but it was definitely exciting and a good warm-up for what was to come. We continued hiking downstream through the beautiful canyon to the next waterfall. This was a big one – over 100 feet. After getting strapped in on a platform at the top of the waterfall, we rappelled down about half way. At that point, the guides screamed “Let go!” and then we let go and sort of ziplined down to the base. A guide at the base controlled our speed and ensured we landed safely. It was an amazing adrenaline rush and just so much fun. After everybody made it down, we continued down the canyon. 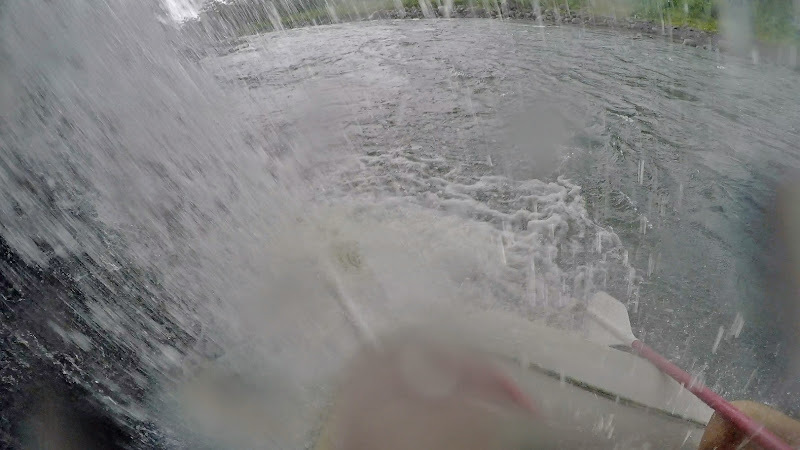 At one point, we were able to jump into a deep pool of water along the river. A little further down, the guides had a surprise in store for us. We all sat down in a narrow slot together and one of the guides blocked the water flow so that it built up behind him. Once we were all situated, he released the water and it came crashing down on us, the so-called "tsunami". After getting our stuff out of the lockers and a quick shower, we had a nice buffet lunch and chatted with our friends about this amazing experience. Then we took a 4WD back to the base of the mountain and a bus ride back to the hotel. The bus driver asked who was staying at Monte Real. He said it quickly and it sounded like Montreal – for the rest of the trip, we joked about being from Montreal. We stopped at the hotel briefly and then got back on a bus to Los Lagos Hot Springs and Resort. After renting lockers to keep our stuff dry, we headed to the springs. First, we headed down the water slide into a big, warm pool with a swim-up bar. Can’t get much better than that! We had some drinks and hung out in the warm water. There was another slide, but it was much colder, so I only went down that one once. We all hung out in the pools for a couple hours, drinking and socializing, and then around 8, we got out and changed clothes had dinner at the resort. After dinner, we headed back to the hotel and went to bed after a great day. Sunday morning, we were heading to Monteverde. 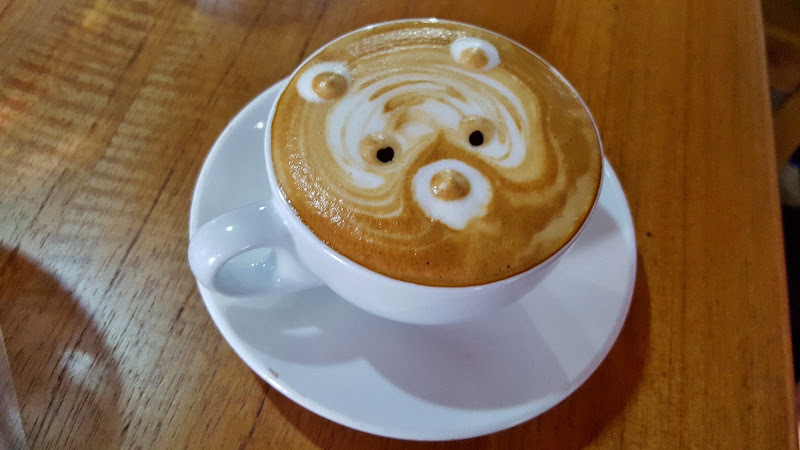 We had breakfast at the Rain Forest Café again and asked them to make a “teddy bear” in the café con leche. I don’t know if the foam made a difference, but it seemed to taste better! Sandy couldn’t find Bert again this morning, though. After breakfast, we checked out of the hotel and got picked up to head to Lake Arenal. At the dam, near where we had paddleboarded the day before, we boarded a boat to cruise across the lake. It was very cloudy again, so we couldn’t see the volcano, but the cruise across the lake was very scenic. At the other side of the lake near where Río Chiquito flows into the lake, we boarded another bus and began driving along the gravel roads towards Monteverde. Although the roads were bumpy and steep in places, they really weren’t too different from the gravel forest roads in the mountains that we drive back home. The drive was quite scenic as shortly after leaving the Lake Arenal area, the clouds cleared and we began to have nice views. Shortly before reaching Monteverde, we made a stop at El Trapiche plantation. 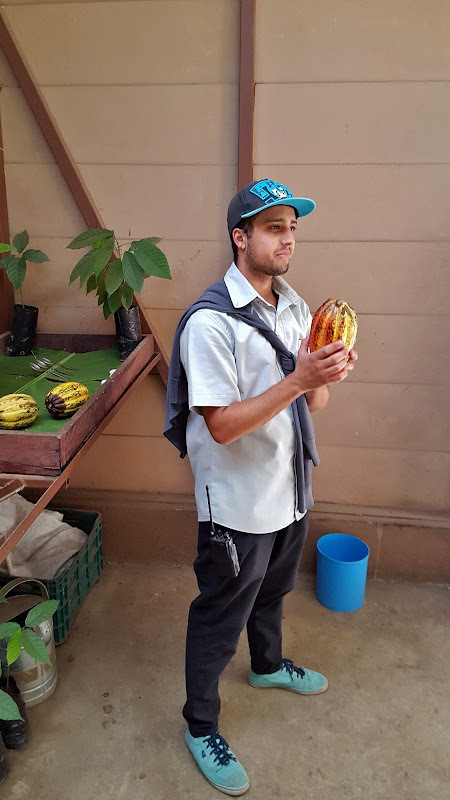 We were taking a tour of this plantation that grows sugar cane, cacao, and coffee. There were many beautiful flowers growing around the farm house and shop. Before the tour, we had a traditional Costa Rican lunch and afterwards, started the tour. The tour guide led us around the plantation where we saw the various crops growing. 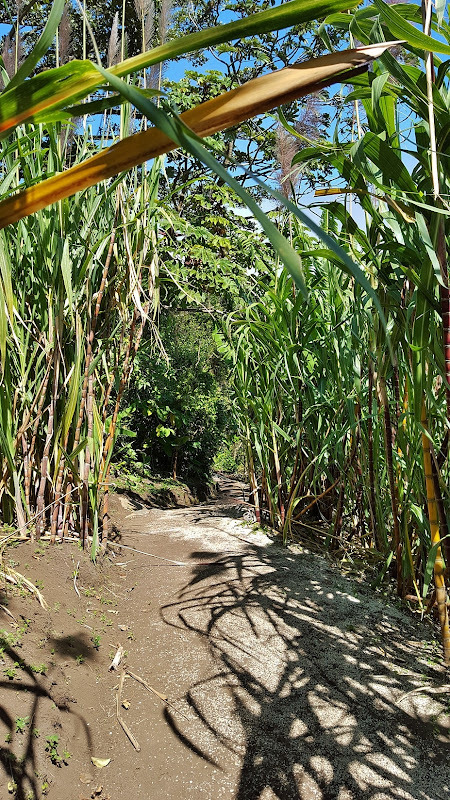 We saw rows of sugar cane growing high above the other plants. They also had some bananas growing here as well. The views here were quite scenic, with the Pacific Ocean and Nicoya Peninsula visible in the distance. We learned all about how these crops are grown in Costa Rica. The Costa Rican government only allows Arabica coffee to be grown. Most of the labor for picking coffee comes from Nicaraguan immigrants; the pay is low and most Costa Ricans prefer to be tour guides. The coffee fruit can produce from 1 to 3 beans. A fruit with a single bean produces the best coffee – peaberry. Two beans are acceptable, but three beans are not to be sold. After touring around the grounds, we headed to a building where coffee processing occurs. As the guide was talking, an oxcart arrived and we rode in the cart to the next building were the guide described cacao processing. There are three ingredients to making chocolate – cacao, milk, and sugar. We first tried raw cacao, with is not sweet and difficult to eat. But once sugar and powdered milk was mixed in, it started to taste like chocolate. We then headed to the final building where sugar cane is processed and distilled to make candy. The guide gave us a sample of sugar cane liquor produced at the still. Then, we headed into the next room where the sugar cane is heated to produce the candy. The processing equipment was powered by the oxen. We were broken up into small groups and each given a warm batch of processed sugar cane to beat until it solidified. This was our last stop on the tour. Before leaving, we headed to the gift shop and picked up some coffee to bring home as gifts (and to keep for ourselves). We then boarded the bus again and finished the drive to Monteverde. Our hotel was Atardecer, which had lovely gardens around the hotel with beautiful hibiscus and other flowers growing. After checking into our room, I went up to the second floor to get some pictures of the sunset over the Pacific Ocean. Then Sandy and I left to go on a guided night hike. Our guide first took us right outside of the building to a small hole in the ground. There was a tarantula in there, but she was hard to see in her current position, so the guide suggested we come back at the end. From here, we turned on our headlamps and started hiking down some trails and gravel roads on their property. 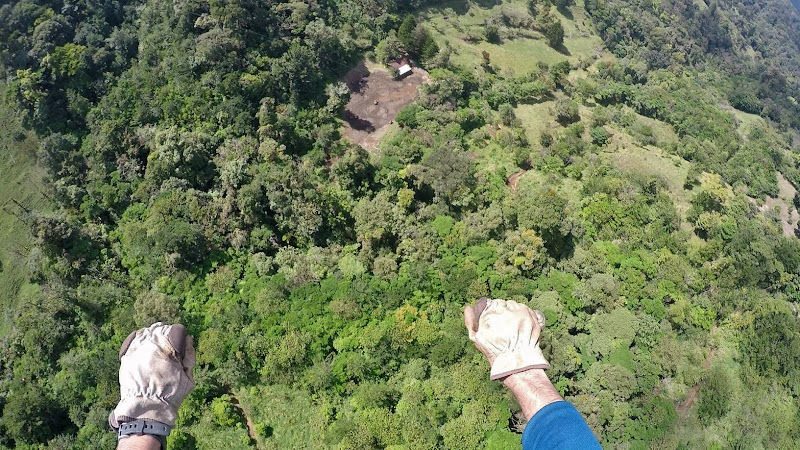 We saw a sloth high up in the trees undulating back and forth, to remove ticks and other insects from him. Unfortunately, he was high up in the trees and it was hard to get a good view. We continued hiking and the guide pointed out some birds that were sleeping in the trees. We saw an Emerald Toucanet. They sleep with their heads under their wings, so he basically looked like a green blob. The tour guide shined his light and told us to look for the “big avocado”. Further on, we saw a motmot, a really beautiful bird with unusual tail feathers shaped like a racket. Besides the birds, we also saw two very poisonous pit vipers resting in the trees just off the trail. Good thing to have a guide to point out these critters. We also saw an interesting leaf-mimic katydid. It was half green leaf and half dead leaf. After hiking around for a couple hours, we headed back to the start. The tarantula had come further out of her hole so we could see her much better. Then the bus took us back to the hotel. Once back, we got with Ro and everybody joined to go for dinner at a nearby pizza place. Definitely not typical Costa Rican fare, but it was good pizza. After dinner, we went to bed. Unfortunately, the walls and ceiling were very thin so we could hear every movement from adjacent rooms and didn’t get a great night’s sleep. Monday was a full day in Monteverde. We started with breakfast at the hotel and then were picked up to head to the Santa Elena Cloud Forest Reserve. Here, we had a guided tour through the beautiful cloud forest. 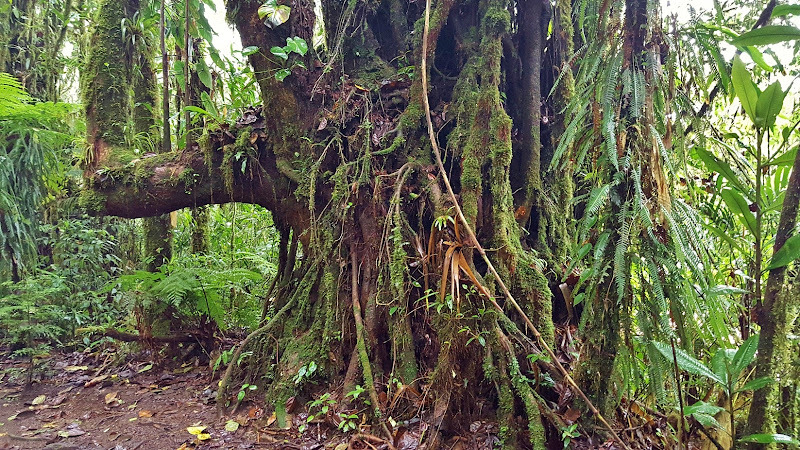 This reserve is smaller and less well-known than the Monteverde Cloud Forest, but full of diverse wildlife nonetheless. True to its name, there were dense clouds hanging in the canopy and visibility was poor. But the lush forest was absolutely beautiful. 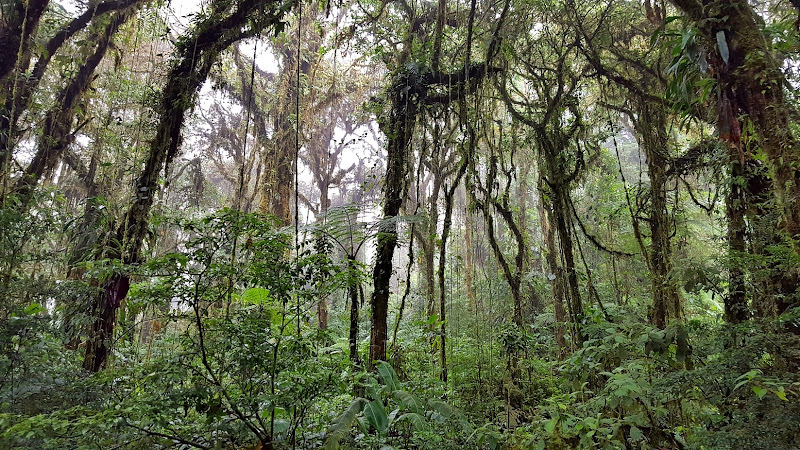 Having slightly less rainfall than the true rainforests on the Caribbean side of Costa Rica, these forests still support and incredible diversity of wildlife. 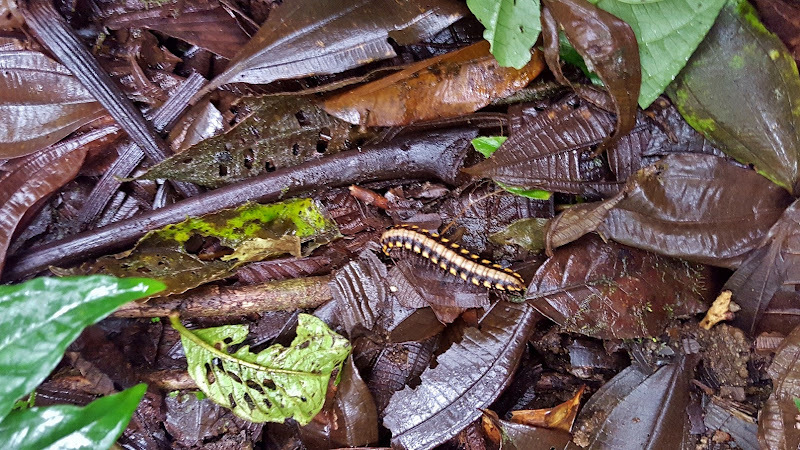 We saw a large python millipede scurry through the lead litter on the forest floor. The guide also pointed out another tarantula in her hole. Only the females live in the holes, so it’s easy to differentiate gender. As we continued higher into the cloud forest, it became foggier as we were pretty much in the clouds. We hiked as to the highpoint in the cloud forest, over 1500 m, which marked the continental divide for Costa Rica. There was a lookout tower here, so I climbed to the top. The ladder rungs and railings were wet from the clouds, so I went up very slowly. At the top of the top, I was actually above the clouds, but they were so dense, Icouldn’t see much of anything. The tour guide told us that on a clear day, you can see Lake Nicaragua to the north, but definitely not today. 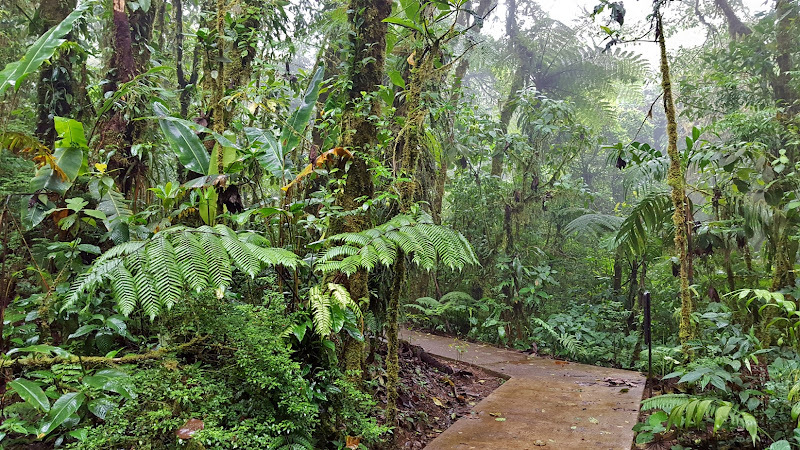 From here, we started making our way back to visitor center, with a few more stops to see the incredible plant life in the cloud forest. Back at the visitor center, we purchased some locally-made gifts in the shop and had a snack to eat. 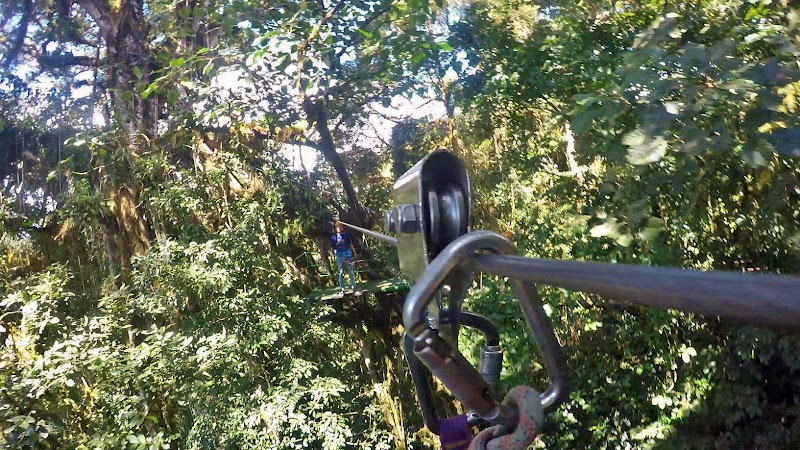 Then we boarded the bus and made a short trip to 100% Adventura park for ziplining. Although we could have done ziplining in La Fortuna, Ro had recommended we wait and do it here, because this was the best one. After getting our equipment on and a brief training, we set out. There were a ton of people doing it, so there was a long wait for the first one, but after that, everyone was spread out enough that the waits were short. 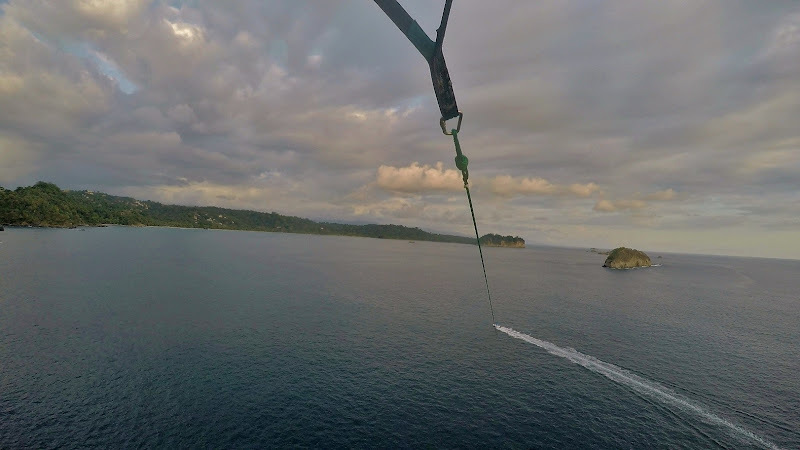 First, we did a couple real short ziplines to get used to it, followed by crossing a rather treacherous suspension bridge. Then we did about four more medium length ziplines, followed by a short rappel. We were finally on the lines long enough to pick up some speed. After the rappel, was last regular zipline and it was longest. This was also the last bailout spot and a couple from our group decided to bail. After coming out through the trees, we came out to a wide open area where we high above the valley below. Fortunately, they have a strong brake right at the end to slow down. From here, we had to hike up a rather steep old road to another platform where we did the first of two cable Superman ziplines. 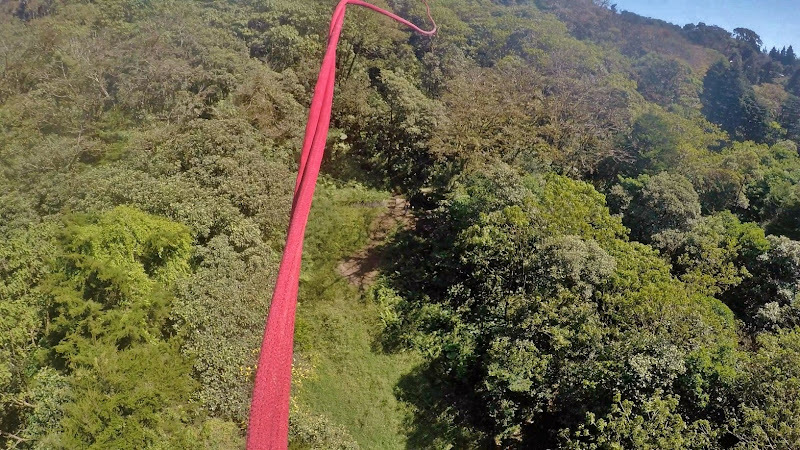 On these, we were strapped up by our backs so we could fly like Superman through the canopy and high above the valley. The first cable Superman was the longest run, about 1.5 km. I ran my GPS while ziplining, and I got to more than 45 MPH on this run. Far below, I could see some ATVs offroading. The Superman was fun, but it put a lot of pressure on my ribs and kind of hurt. After the second one, I was glad to be done. But there was one last attraction before we finished – the Mega Tarzan swing. 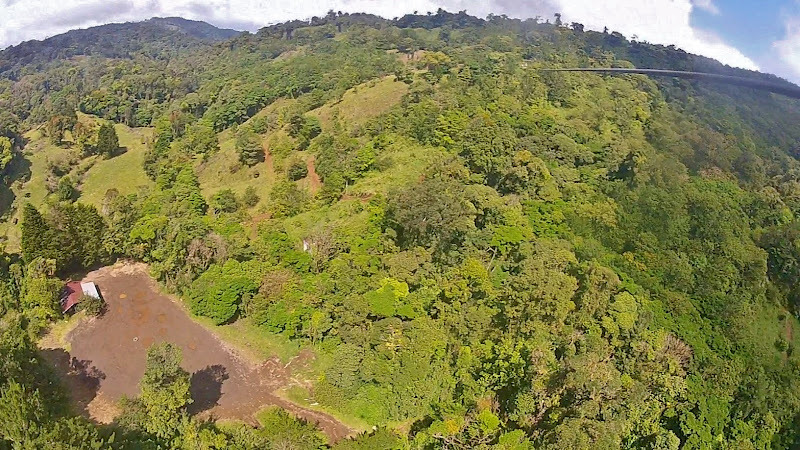 For this, I walked across a suspension bridge to grab the swing and go flying down. We were coming back for the Hanging Bridges tour, but first we headed into town for lunch at Taco Taco. Sandy and I had fajitas, which were much different than what we’re used to. They were already pre-made and had a different flavor than what we get at home, but were still quite good. More like soft tacos. Then we caught a bus back to Adventura for the Hanging Bridges tour. 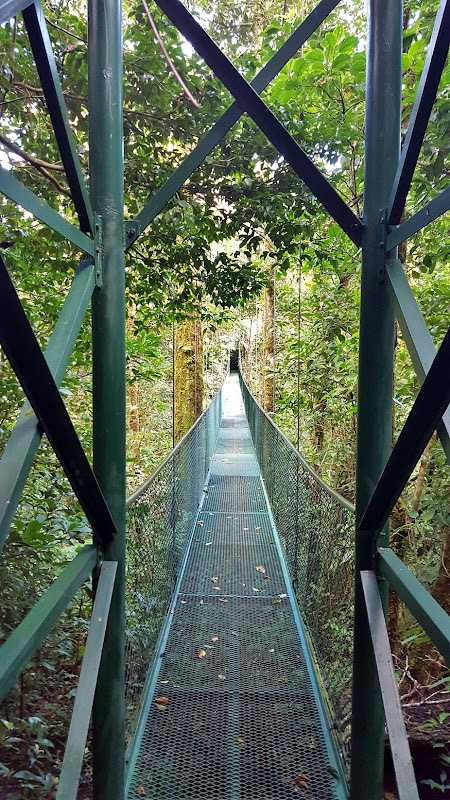 Our guide took us on a nice hike through the forest and along the suspension bridges. 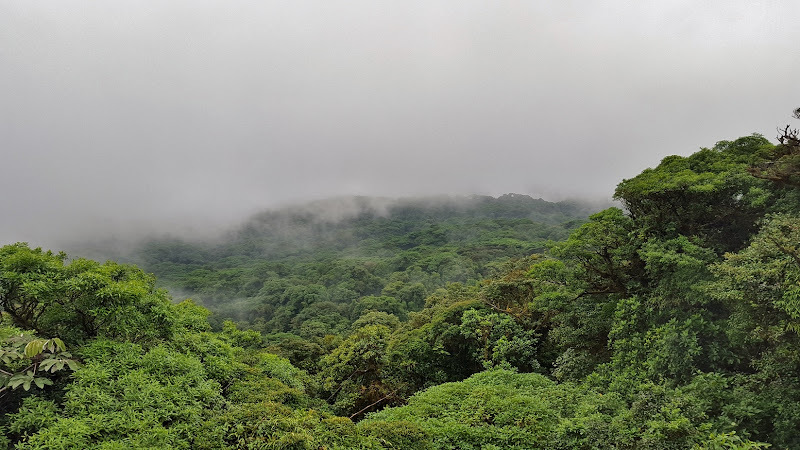 We were lower in elevation than in the cloud forest, so much better visibility and views of tropical plants and wildlife. 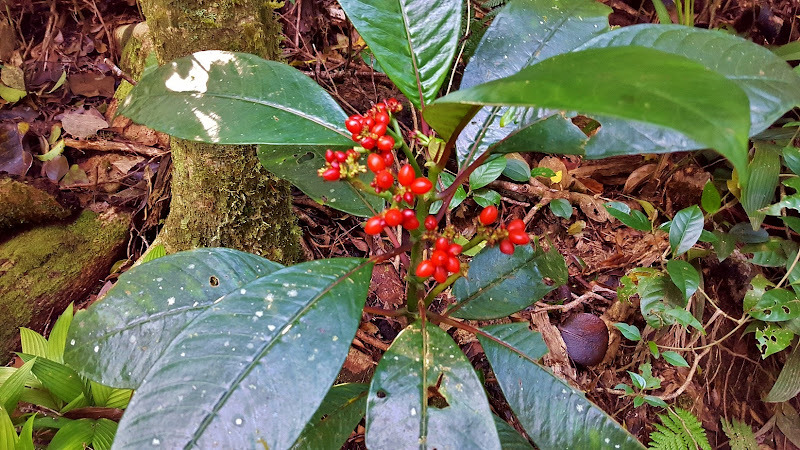 The guide pointed out wild coffee that was growing along the trail. A little further, he showed us a spiraling flower that demonstrated a Fibonacci sequence. 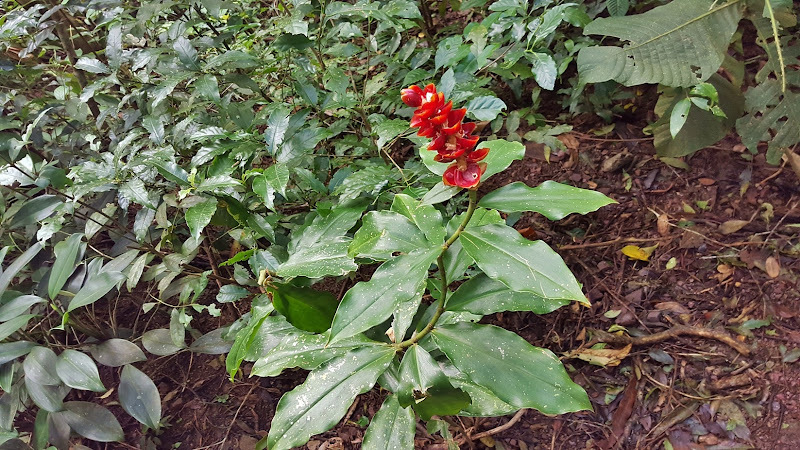 One of the most interesting plants was the hot lips flower - no question how this plant got its name. Further down the trail, he pointed out a venomous side-striped palm viper resting on a branch. These snakes are highly poisonous, but fortunately, Costa Rica has antivenom for all the poisonous snakes in the country. If you get pit, snap a picture of the snake so medics no what type of antivenom to use. The guide had been bitten and received the wrong antivenom and nearly died! Walking along one of the bridges, the guide pointed out an owl high up in the trees. Further on, we saw another tarantula in her hole, this one with an egg sac. Towards the end of the tour, we came to a huge ficus tree that was hollow on the inside. 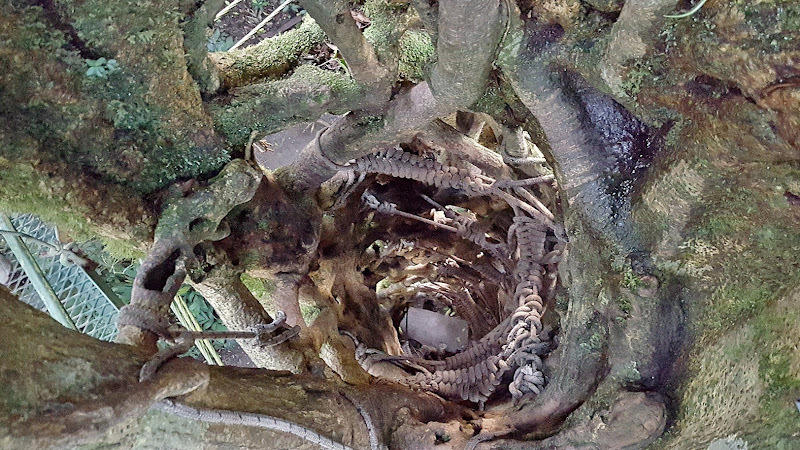 They had placed some ropes in there and it was possible to climb up the inside of the tree up to the next bridge. From here, we followed the trail back towards the visitor center. Right before finishing our hike, we came to a hummingbird garden where there were a number of feeders. We saw quite a few of the little birds zipping about and feeding. I think they were white-necked jacobin hummingbirds. After a couple of pictures, we finished our hike back at the visitor center. The bus came to bring us back to the hotel. Once everyone returned to the hotel, we walked into Santa Elena for a Costa Rican dinner at Sabor Tico and then went back to the hotel for the evening. Tuesday morning, we had breakfast at the hotel and then packed up to leave. After two nights of poor sleep, I was ready to check out. A bus picked us up and we started making our way to the coast. 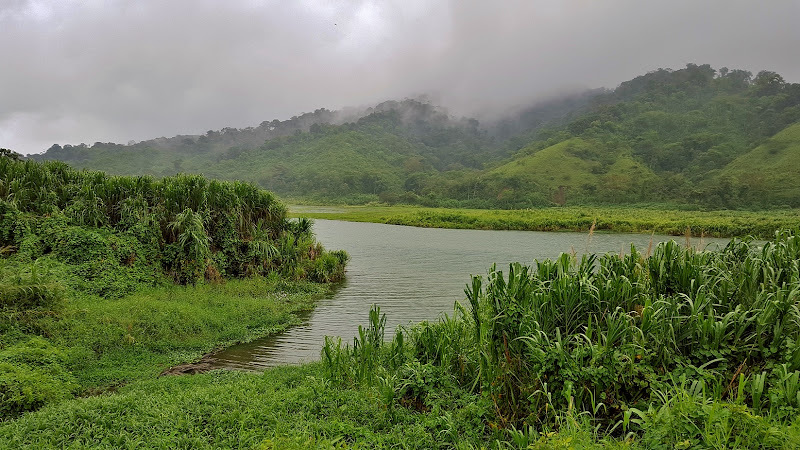 Initially, we were on gravel roads and Ro had the driver stop at one point along Road 606 near San Luis with scenic views of the mountains around Monteverde. Monteverde means green mountain and the reason for the name was clear from this view point. After a couple pictures, we continued on, eventually reaching paved roads by the coast. It was still several hours to Quepos, so we stopped at a rather touristy gift shop for a break. Everything was overpriced, so we didn’t get any souvenirs. A little further on, we made another stop at Río Grande de Tárcoles. From the bridge over the river, we could see a number of large American crocodiles basking in the warm sun along the river bank. Ro jokingly said this was a good river to learn to swim - you'll pick it up quickly. Fortunately, I already know how to swim, so stayed safely up on the bridge. We then finished up the drive to Quepos, stopping at our hotel just outside of town. We were staying at Pacific Paradise Resort. All of our rooms weren’t ready yet, but they let us have a couple rooms so we could drop our luggage. Then we headed into town and had lunch at Gemelas right on the beach. After lunch, we headed out to the beautiful beach. It was incredibly hot in Quepos so the water felt really great, perhaps a little too warm. We played in the water for a while and then I headed down the beach to the end. 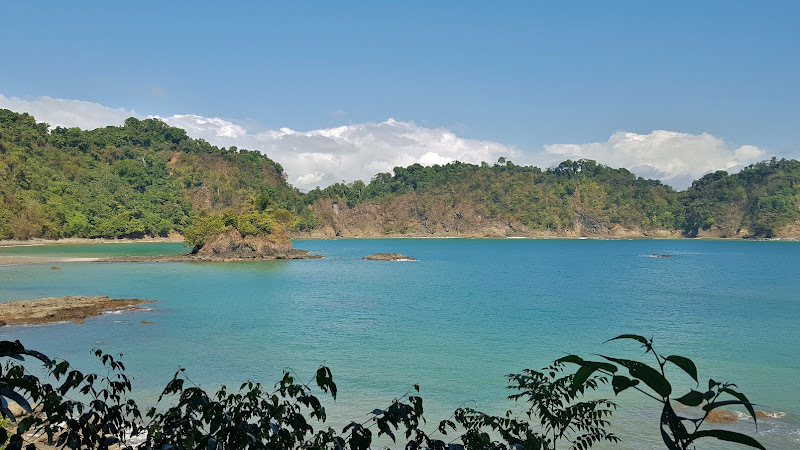 There was a river here and across was Manuel Antonio National Park. A sign indicated not to cross the river due to crocodiles in the water. I didn’t see any, but stayed out of the water anyway. There were some cool volcanic rocks sticking out of the water here that I could wade out to and climb around on. 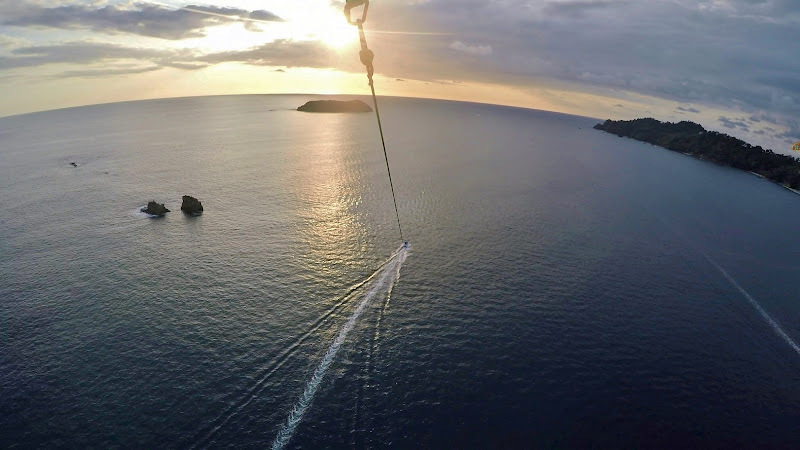 As the sun was getting ready to set, Sandy and I decided to try parasailing. The operators were booked, but Ro was able to get us in. We took off from the beach and soon were flying high. The views of the beach and surrounding mountains were just fabulous from the sky. We could also get a nice view of the small volcanic islands just offshore. The speedboat took us out past the bay and then turned back around towards shore. As we approached the shore, the boat slowed down and we began to descend until we hit the water. We got out of our harnesses and a guy in a jet ski picked us up and brought us back to shore. 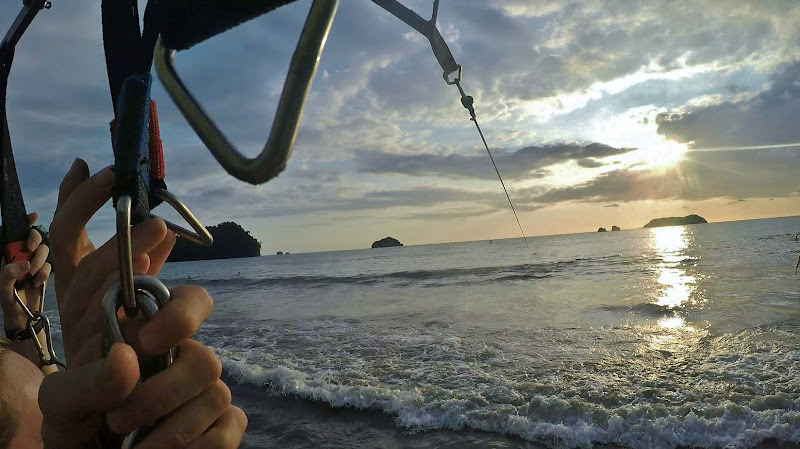 It was our first time parasailing and we really enjoyed it. The views of the beach and sea at Quepos were stunning. Back on land, we packed up our stuff and took a public bus to El Avion bar. 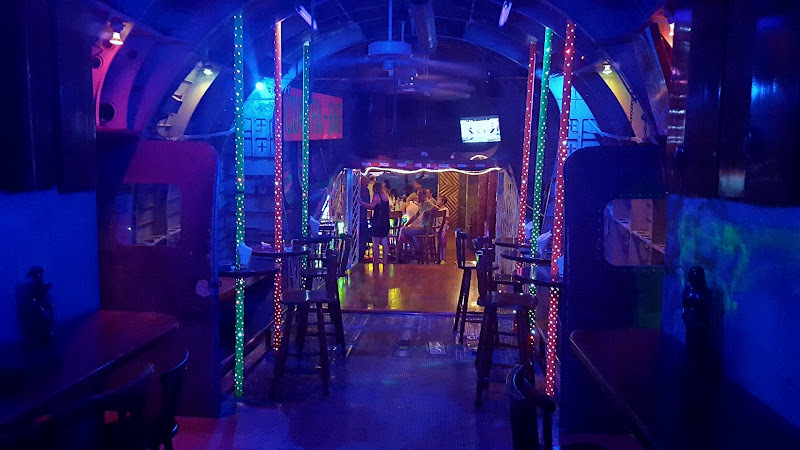 The bar was built around an old bomber jet that had been abandoned during the Iran-Contra scandal. 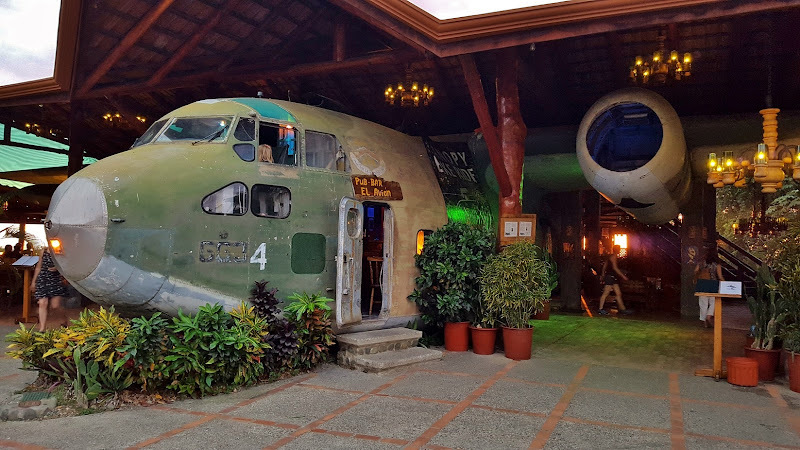 Guests could go into the old plane and there was even a bar in here. The restaurant was perched up on a cliff overlooking the sea, we had wonderful views of the sunset. Ro indicated this place was a little expensive, so we just had drinks here and would wait for dinner. We then caught a bus back to the hotel and checked into our room, then made a short trip to have seafood for dinner. I’m not a big fan of seafood, so I got chicken. Sandy greatly enjoyed her crab legs, however. After dinner, we swung by town to hit the ATM and give Ro money for our entrance tickets to Manuel Antonio National Park. It was the peak of tourist season and the park was turning away visitors after they reached the quota. Ro was going to leave very early in the morning to secure our tickets. Wednesday morning, we had breakfast at the hotel. It was complimentary, but the continental breakfast consisted of some toast – not very filling. I learned by lesson and got the Costa Rican breakfast the following morning. After breakfast, we headed into town and met Ro at the entrance to Manuel Antonio National Park. It was incredibly crowded, but thanks to Ro, we were able to get in relatively quickly. Even early in the morning, it was very hot and humid so we picked up an extra water from one of the many vendors along the road heading into the park. Entering the park on the main road, almost immediately we saw some white-faced caphuchin monkeys frolicking about in the trees. About half-way down the road, we took the Sendero Paralelo trail and saw a deer just off the boardwalk. 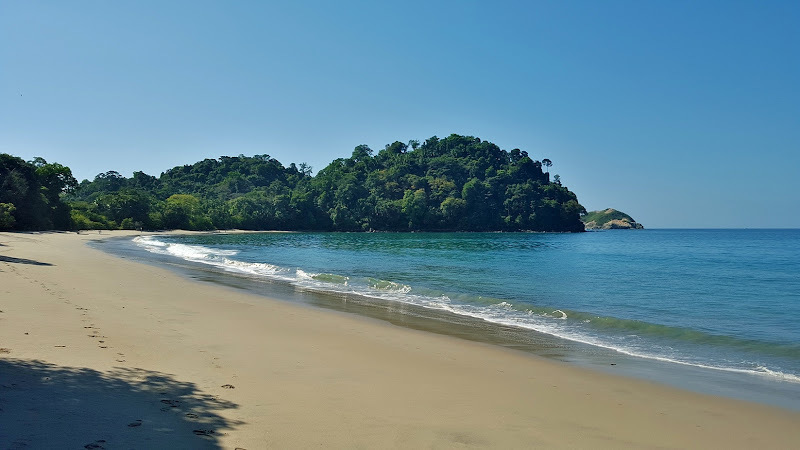 At the end of this trail, we came to the restrooms and the main beach in the park, Playa Manuel Antonio, and it was tremendously crowded. Ro suggested we go to another beach, just a short ways away. There was almost no one here at Playa Espadilla Sur! It was just great to have someone show us all the local tricks so we could concentrate on just enjoying our vacation. For an hour or so, we pretty much had the beach to ourselves. We dropped our stuff in the shade and headed out into the water to cool off. At least one person stayed on shore with our stuff while others were in the water. This was intended to ward of human thieves, but there was another type of thief at this beach. A pair of crab-eating raccoons came out of the woods and started going through unattended backpacks. They worked as a team and quickly got the bags opened and rummaged through them for food. The raccoons were fairly aggressive, but would flee when sand was kicked at them. I walked around on the beach for a while getting pictures, taking a dip in the ocean when I got hot. After a couple of hours on the beach, Sandy and I headed off on a hike around the park. We went to Playas Gemelas, a double beach separated by volcanic rocks. While I was taking some pictures of the beach, Sandy found a huge black iguana. We then continued on to the overlook for Playa Punta Escondido beach. The path leading down to water level was blocked off for safety, but we had lovely views of the small bay. We then started making our way back. There's no food in the park and it was well past lunch time, so we were all getting hungry. I made a quick detour on the Sendero La Catarata, but this waterfall is seasonal and it was too dry to be flowing. As we were almost out of the park, we saw some Costa Rican squirrel monkeys in the trees just overhead, picking fruit to eat. They were really cute! We left the park and headed back to Gemelas for lunch again. They had good food and great service so we decided to eat here again, since it was conveniently close to the park entrance. After lunch, we got picked up to go kayaking in the mangrove forest. The driver took us out to the put in on Rio Paquito at Isla Damas. There was a delay in transport, so we got started late and it was already nearing sunset. 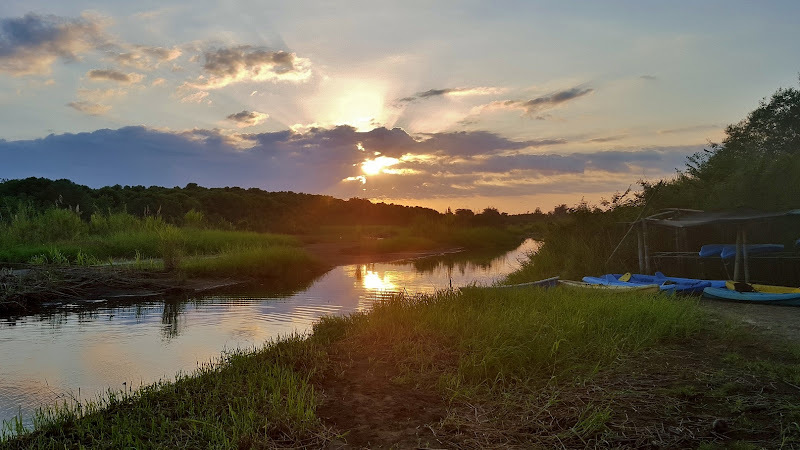 But the views along the river were absolutely gorgeous as the sunlight was fading. Shortly after getting on the water, we spotted a beautiful white heron in the shallow water. 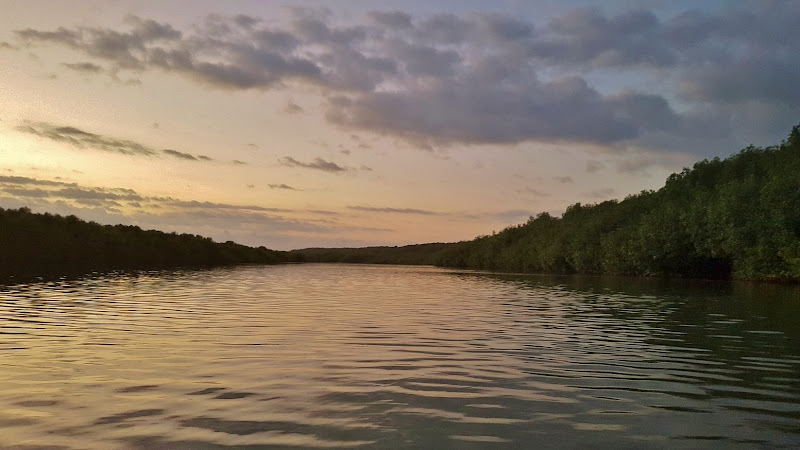 We paddled down a ways and headed into the mangrove forest. Our guide gave us some information about the different types of mangroves in Costa Rica. We didn't get a lot of time in here before it got dark, so soon we started paddling back. As we were going, a large swarm of bats flew overhead. By the time we got back to the put-in, it was completely dark. 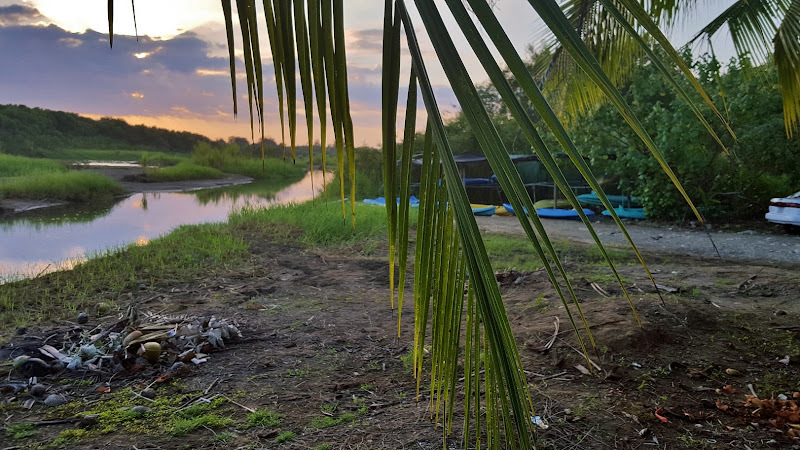 We pulled our boats of the water and got back in the van and our guide took us to dinner at Rancho Leon. After dinner, we headed back to the hotel. Sandy got a massage while I swam in the pool. Then, we started getting our stuff packed up. Thursday morning, we checked out of the hotel. The front desk was nice enough to hold our stuff while we went on one more activity in Quepos. 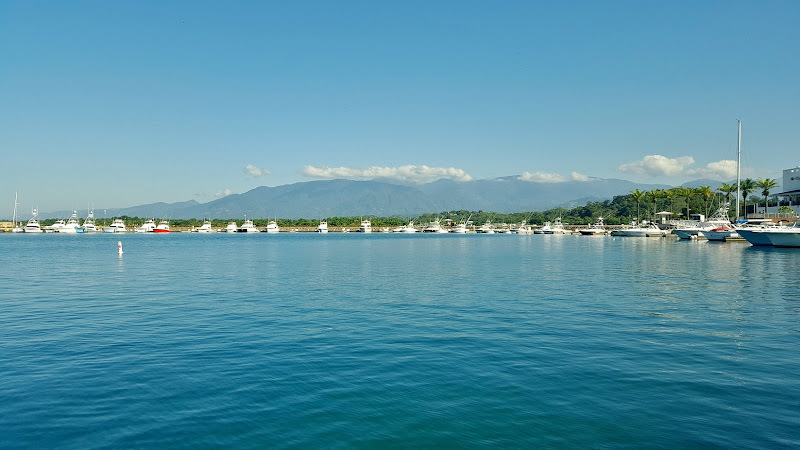 We drove down to the marina for sailing in a trimaran, similar to a catamaran but with three hulls. I wasn’t real excited about this as I'm not really into sailing, but Ro recommended it and the I wanted to spend time with the group on our last day. We arrived at the marina and checked in and then boarded the trimaran. They had delicious rum punch, along with water and soft drinks, to drink while we were on the water. 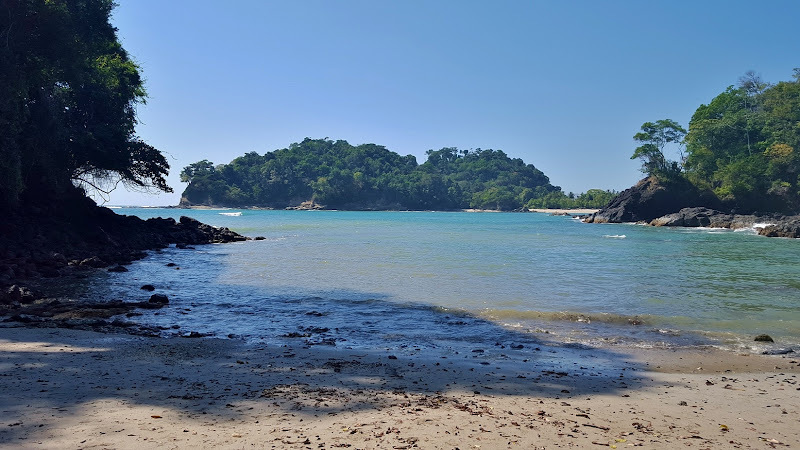 From Quepos, we headed to the Manuel Antonio area where we could see the beaches we had spent the past couple of days at. We also circumnavigated the volcanic islands sticking out of the water off the coast. The crew spotted some brown booby birds and said they're a good sign of dolphins. The birds scavenge for fish left by the dolphins and are a good indicator of where to find them. Follow the boobies! We sailed over towards them and soon we saw a pod of spinner dolphins swimming around the bound. These dolphins are known for their aerial acrobatics but weren't doing anything today. The swam around the boat a couple times and then swam off. Then we headed over towards Playa Biesanz, where the boat anchored. The guides provided snorkel gear, but Sandy and I had brought our own snorkel and mask. We prefer to not use ones that have been used by others. 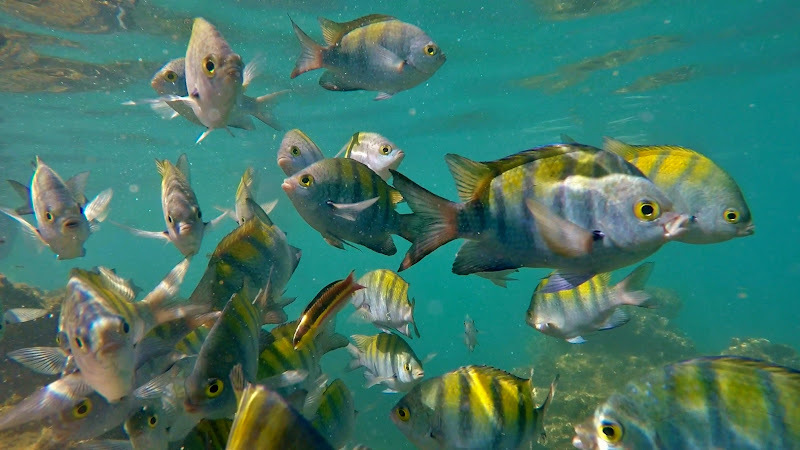 We hopped into the water and swam over to a reef where a number of tropical fish were. 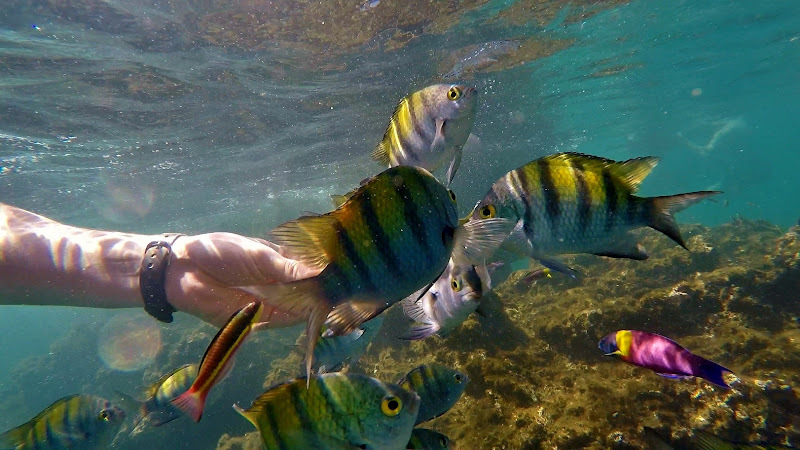 The majority of the fish were Pacific Sergeant-Majors, but we also saw a couple of Cortez Rainbow Wrasse and other beautiful fish. One of the guides gave us a piece of pineapple to feed them. Holding a piece in the water caused them to go into a feeding frenzy right in front of us. After snorkeling for a while, I headed back to the boat and rode the water slide a couple of times and did a couple jumps into the water. Then, we had lunch on the boat. They mainly served fish and I was going to eat it, though I don't care for seafood. But Ro was nice enough to talk to the guys and they made me chicken instead. They claimed it was a seagull they caught while I was snorkeling. After lunch, we started making our way back. We had all been drinking a bit, so the guys turned the music up and we had a little dance party on the boat as we sailed back to the marina. From here, we took a bus back to the hotel and get our bags. 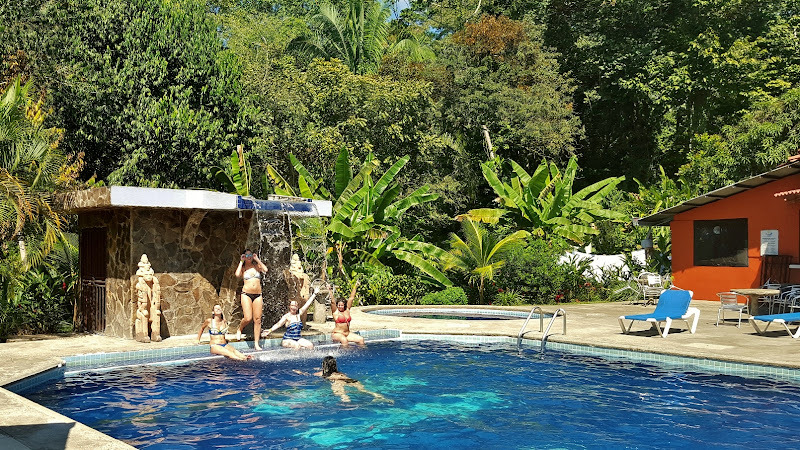 The bus to take us back to San José was delayed due to a flat tire, but the folks at Pacific Paradise were nice enough to let us play in the pool while we waited. Soon the bus came and we started making our way back to the capital. We stopped at one little road side shack for a bathroom break and a few people got some souvenirs and snacks. The people who owned the shack were grateful to Ro and gave him a bag with a couple little souvenirs. As we were driving back, Ro asked some Costa Rica trivia questions and gave away the souvenirs. I won a sloth key chain for being able to name the most Costa Rican provinces. 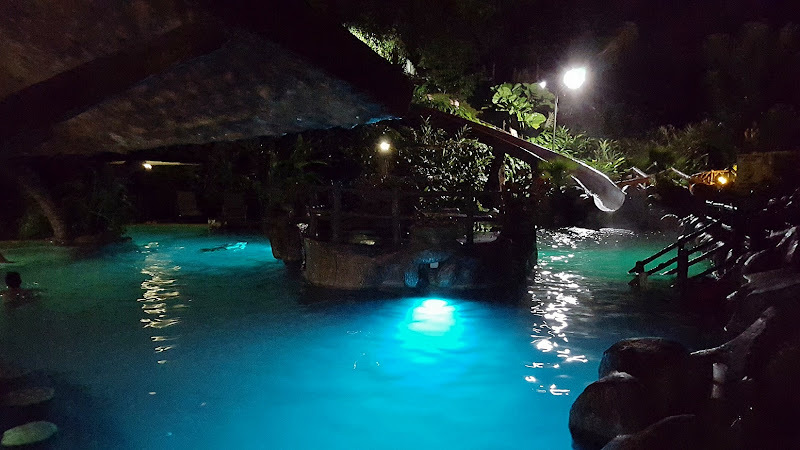 Back in San José, we checked back into Hotel Auténtico for our last night in Costa Rica. For dinner, the whole group headed to Las Mañanitas, a Mexican place restaurant just a couple blocks from the hotel. It was different than the Mexican food we get at home, but really good. And I suspect for authentically Mexican. It was Tim's birthday so Ro talked to the owners and they brought out a cake and sang. Tim didn't want to celebrate his birthday, so it was a lot of fun! After dinner, a few people catching early flights went back, but most of us were going out to the clubs for New Years Eve. Another G Adventures group that just arrived was also going out. Ro had suggested going to El Pueblo, an complex with several clubs and bars connected. The other tour guide, however, insisted on going to another bar first, I guess because it was cheaper. This place, I didn't bother getting the name, was a little sketchy. The only redeeming quality was the great laugh we got over the “bathroom”. The men’s room lacked a sink, a toilet, and even a door! Soon, we convinced Ro that we should leave and headed to El Pueblo. 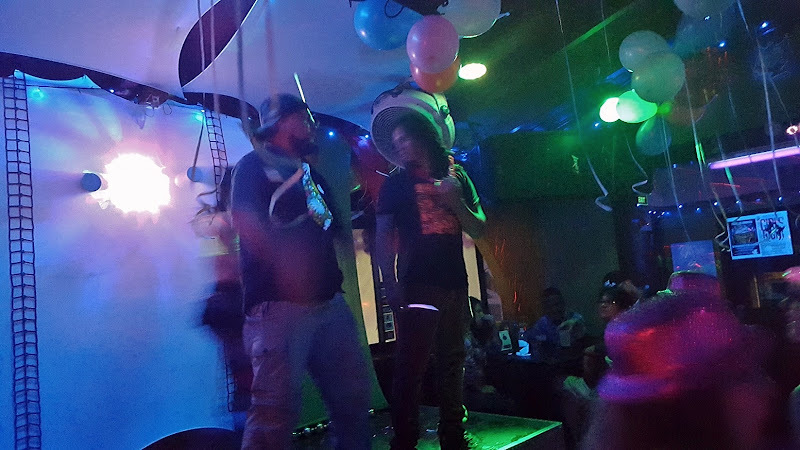 It was a great time of dancing and partying, ringing in the New Year. Ro said that New Years Eve is more of a family holiday than a party holiday so most of the locals stay home. We ended up being the biggest group and just had a great time dancing and drinking at the clubs. Around 2, we got a cab back to the hotel and went to bed. Friday morning, we had breakfast at the hotel with everyone who was still in Costa Rica. After breakfast, Sandy and I went for a short walk around Parque La Sabana one more time before our flight. The lake was very pretty. A couple of people in our group had considered hitting the art museum before departing for the airport. It's right next to the park, so we swung by and it was closed for the holiday.